The metamorphosis from daily fantasy to sports betting operator became complete on Saturday when the FanDuel Sportsbook launched at Meadowlands Racetrack in East Rutherford, N.J., on the same premises as MetLife Stadium, home to the New York Giants and Jets. FanDuel will remain in the DFS business, but this new sports betting opportunity in the U.S. is much bigger with the vast majority of the market yet to be captured. A nervous excitement pulsed through the recently-remodeled Victory Sports Bar & Club inside the facility, where 10 ticket windows were staffed by employees wearing collared shirts emblazoned with a FanDuel Sportsbook patch. Some of the employees at the New Jersey sportsbook are brand new hires who received about two weeks of intensive training prior to Saturday. Six betting windows ready to go on on one side or the Victory Bar inside @TheMeadowlands FanDuel Sportsbook. Executives and officials on hand for the occasion included Matthew King, appointed CEO of FanDuel in November 2017; also lawmakers Senator M. Teresa Ruiz (D-29th District), Senate President Pro Tempore, and Assembly Member Ralph Caputo (D-28th District), a co-sponsor of the bill that legalized sports wagering in the state. These and other officials offered remarks from a podium at the front of the house about an hour before the sportsbook opened to the public. The deal began exactly one month ago on June 14 when Monmouth Park in Oceanport, N.J. became the first sportsbook to open, under the direction of operator William Hill. The MGM-owned Borgata began taking bets shortly thereafter in Atlantic City. Together those two properties (with some help from three days of wagering Ocean Resort, also operated by William Hill), generated $3.4 million in gross revenue (on a cash basis accounting method). New Jersey collected $293,000 for its coffers. 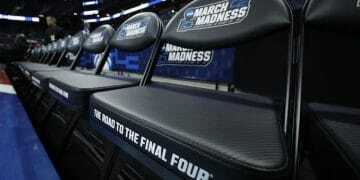 This all comes after New Jersey won its Supreme Court case, Murphy v NCAA, in May against the NCAA and major pro sports leagues, which together had blocked efforts to legalize for a decade under the now-extinct federal law banning sports wagering outside Nevada, the Professional and Amateur Sports Protection Act (PASPA). “[Legal sports betting] is going to make something that’s been in the shadows and taking place illegally, and make it legal,” said Meadowlands Racetrack Chairman Jeff Gural. Former, longtime NJ senator Ray Lesniak speaking. Celebrating giving NJ economy "shot in the arm." The Meadowlands has been preparing for this moment for a while. So has FanDuel, whose acquisition by the powerful Ireland-based bookmaker Paddy Power Betfair (PPB) was completed just this past week. 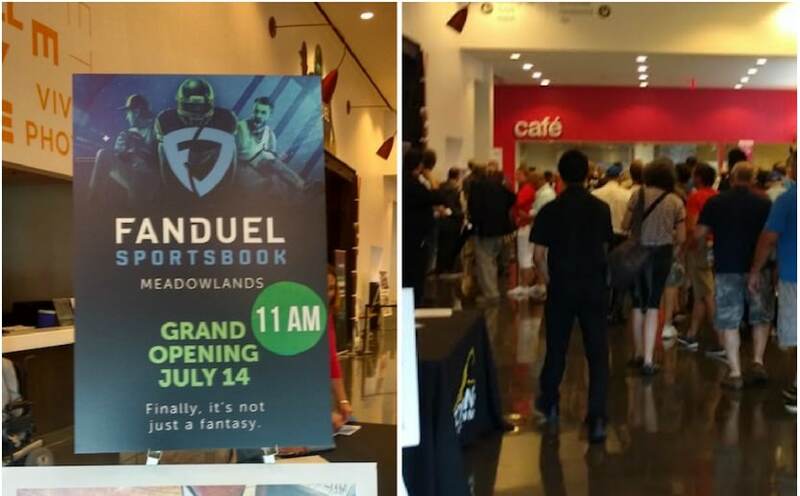 PPB has been instrumental in preparing the FanDuel Sportsbook for launch — with FanDuel serving as the face of the collective operation, as evidenced by the abundance of signage around the property erected at the temporary facility. The sportsbook will be undergoing an expansion and remodeling before football season that will increase the number of ticket windows and televisions and more. “The betting software is good, it’s simple, quick and accurate,” one ticket writer said. “I like it.” But no doubt there are some jitters. One employee who booked a $500 wager was “almost shaking,” he told a colleague. King is mindful that while the U.S. sports betting opportunity is tremendous, the competition for market share will be fierce. FanDuel beat fellow DFS giant DraftKings to the punch, but DraftKings is in the game too with a partnership in Atlantic City with Resorts Casino, which is expected to begin operations before football season. Speaking of Paddy Power, there are questions around the industry about why U.S.-based sportsbook operators appear to be idling as European companies make inroads in the U.S. market. “We put out a request for proposals and received seven or eight,” Gural said of their selection of PPB/FanDuel. “Mostly from abroad.” He said the process of choosing their partner, which has now formed the FanDuel Group, took about a month. Engaging Clients and Fans Online and in Retail. One patron at the sportsbook came from Philadelphia just to take in the scene. He didn’t realize until he got there that this was a FanDuel sportsbook. As photographed by a few folks, the @FanDuel #WorldCupFinal lines on winner at @TheMeadowlands are not good right now. If FanDuel Sportsbook wants to attract any semi-experienced or discerning customers going forward, it will have to re-evaluate the vig. Will it adjust when there’s more competition in the market? Another open question is how the leagues will embrace legal sports betting, or create distance from it. The leagues have been pushing for a controversial “integrity fee” or “royalty,” in which they would take a percentage off the top of all wagers booked legally in states that would grant them such a request. 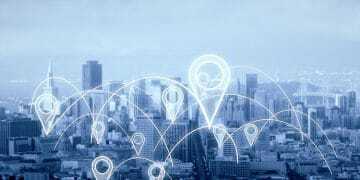 But so far no state has imposed such a cost upon its licensed operators. The FanDuel Sportsbook at the Meadowlands is in a unique position given its proximity to an NFL stadium, MetLife. ESPN’s David Purdum reported that there has been talk about a shuttle between the stadium and the sportsbook. On the digital front, FanDuel — which had operated exclusively online until Saturday — is close to introducing its online sportsbook product and mobile app. Mississippi sports betting and West Virginia sports betting will be next to move. Both states are preparing operators to open up shop before football season. FanDuel also secured a partnership The Greenbrier Resort in West Virginia, which is one the Mountain State’s five licensed properties gearing up. The U.S sports betting opportunity is vast, and the opportunity and experience in each state and venue will be at least a little bit unique. And ever changing. Indeed, the evolution has only just begun.